Becoming a Grab driver proved to be a good financial choice for former customer. Grab was his go-to app whenever he had to travel around Singapore to meet clients. 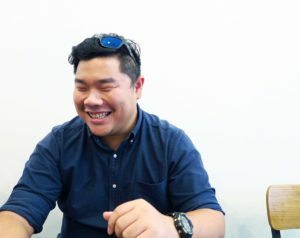 Realising how frequently he used Grab, operations director Dennis Chia decided that it would make more sense financially for him to become a part-time GrabCar driver. He shares the perks of driving with Grab, including garnering a new client for his company. About a year ago, I started an events management and brand marketing company with my friends. I travelled a lot to meet clients during office hours and ended up using Grab quite a bit. It got to the point where I decided it would make more financial sense for me to be a GrabCar driver instead of passenger so I started driving part-time in April this year. I did hesitate for about a month before signing up with Grab as I was concerned about the costs involved, such as car rental and deposit, petrol and parking charges. But my leap of faith has been rewarded. Driving with Grab not only offsets my transportation costs, it brings in a little extra income and opens doors for my business. I used to spend about $1,200 each month on transportation. Now, I spend the same amount, renting a car for $400 a week. I typically drive 20 hours a week with Grab and make about $2,200 a month, which covers all my transportation and fuel costs. This also gives me the ability to drive in Singapore, which – for me – would be too expensive as a private car-owner. My friends who’ve asked about my experience driving with Grab have not followed suit as their transportation costs are not as high as mine, and so prefer to remain passengers. I’m not driving to earn a living, so it’s not stressful. I drive either one Saturday or Sunday, and two to three weekdays after work. Even if I have to travel overseas for a week and can’t drive, it’s okay. I do have some flexibility with my rental contract as I’m renting the car from my friend’s company. Being a GrabCar driver has given me the opportunity to meet people I won’t have met otherwise. It also helps me to network. When passengers ask if I drive full-time or part-time, I tell them about my job and pass them my name card. They are usually surprised that I can juggle running a company, driving part-time, maintaining a relationship with my girlfriend and still have a social life. In the past three months, four Grab customers have contacted me to ask for quotations for their events. I was pleasantly surprised when I received my first call for a quotation from one of my Grab customers in my first month of driving. We are a startup and as long as we are given an opportunity to quote, it means there are doors opening for us. One of them has actually become a client. Driving with Grab provides the environment for me to have conversations with strangers about my company; it’s not something I can simply approach someone on the street about. The almost-daily practice I get in learning to read people when driving with Grab has helped me respond appropriately during pitches so I don’t come off as too pushy or too indifferent when talking to clients. – Dennis Chia, 27, Operations Director.